Several of my friends have remarked that my frankness about my mother's terminal illness is somewhat incomprehensible - especially for those who have never lost a parent. First of all, it is beyond describing. It is excrutiatingly difficult and painful. I want my mother to live. That said, there are guiding lights for me. 1. The Baha'i Faith, first and foremost. This past year, struggling with her cancer, has taught me what true reliance on God is. It ain't easy, that's for sure, but it has allowed me to let go of the control I so strongly craved and was desolate without. I think this is a large part of the struggle over losing a loved one. 2. Prayer. I see so much new meaning in prayer now. Turns of phrases such as "Make Thy beauty to be my food", which I always understood to be a request for detachment from things on this realm - now I read it as a request for my mother when she moves on to the next world. Not that either interpretation is invalid, but it is a new understanding of the possibilities of the power of the prayer. 3. Mimi. My grandmother, my mother's mother, passed away when I was one. She has had such a large influence on my life that I believe I can genuinely say that I do not think I would be where I am today, who I am today, without the relationship I have had with her - which has obviously not been the typical relationship considering she passed away 30 years ago. My connection to her is so strong, and through this I know that my own children will know their grandmother in the same fashion in the event that she isn't on this plane of existence to pamper them as grandparents do. This is not the end for me. 4. Finally, my mother. Her own frankness - having lost her mother in a similar fashion - has helped me go through the process that I have gone through. It highlights how much I rely on my mother, and also how much she means to me. Whenever she dies - be it tomorrow or 20 years from now - she will be missed by many more than just me for her wisdom, generosity, kindess and strong will, among other things. In one week, I will be back in Ohio. And you know, nothing says "I'll miss this place" like a cat peeing all over your freshly cleaned laundry. Anyhew, I'm 15 weeks today. Which means that my baby is supposed to be roughly 4 inches/10 centimeters. 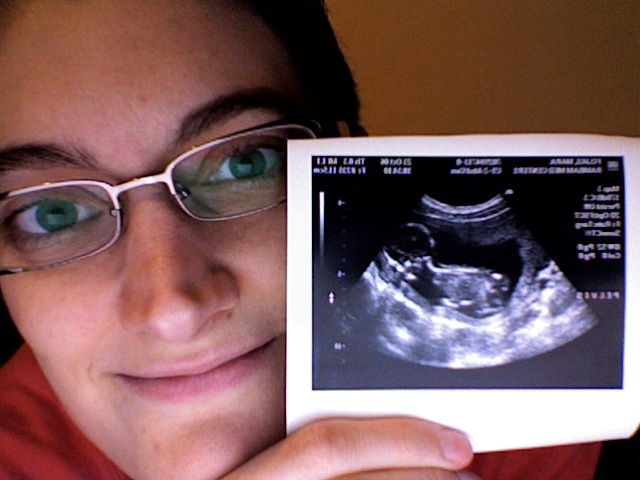 However, as of Tuesday (that last ultrasound I posted), the baby was already 11.5 cm, or 4.5 inches. I measured this and figured out that the baby is larger than my palm (my real hand palm here, not my Palm Pilot, folks), and is quite possibly already up to 12 cm. Now we all know what some of the biggest stressors are in life, right? OH! And HOUSE FLOODING (again? yes! again! )- CHECK! So, you know, if you think you're stressed, well, I've got you beat this time!!! That's me. I'm a winner. I think the photo is pretty clear, but just in case, the head is facing downward on the left - the baby just looks so cozy, no? "In all matter, take your spouse into consideration. Always try to see things through the eyes of the other." This is the advice my mother gave us at our wedding shower. I recently looked over the 3 x 5 card notes from that day, and realized that this is the one I forget most frequently. It's the one I have the most trouble with. I was chatting with my sister-in-law Kristen the other day and had another one of those moments. She and I were discussing my mother's somewhat imminent passing and some of what Kristen and Mendon are going through as a result. Kristen expressed concern that Mendon would expect her to "be there for him" - a solid rock in his time of need. She, validly, pointed out that she'd be grieving as well. Which is when it dawned on me that I expected the exact same thing of Mark, even though he will, in all probability, be grieving as well. D'oh. So, in advance, I'm asking all of you (who are not related to me) to be there for us*. And thank you, Kristen, for helping me realize this important need. *If you don't know what to do, I have learned the overwhelming importance of food at such times. So, if you're in the area, bring us food. There's a hairdresser here that some of us have followed for a while as he graduated, started at a salon, etc. He's now currently salon-less, but he'll come to our place and use it as a salon if we organize a few friends together for cuts, dye, etc. So yesterday, one of our friends did just that. We all went over to her place for our appointments, chatted and goofed around. Mark and I stuck around for a while as sometimes if we left that would have left the hairdresser alone in the flat with just one woman. And we got hungry. So we raided the kitchen. We first ate chips (I know, nutritious, hello!). Anyway, the bags each had a tattoo in them! So yesterday, Mark and I got haircuts and tattoos. Mark has a cobra which we put on the nape of his neck. He thinks it's very cool. I have a rose on my wrist- THAT GLOWS IN THE DARK. Yes. I think mine is cooler. Well, don't forget to include your Ipod! And yes it is real. They get better - so make sure to check out the links on the left for the specific sizes (Ipod, Nano, Shuffle...). And your Mac? What will it wear? Wouldn't want it to feel left out, no? I've started looking for work back in Cleveland near my parents. Just for kicks, I typed in "French" as my keyword. You know, just to see. I got one hit. "Wow," I thought, "that's more than I expected." So I clicked on it to see what the job was. And I quote, "Tired of smelling like a French fry?" When my mother told me that her cancer was back I was at work. I took it rather matter-of-factly, and moved on. Now is preparation time. Looking back, I know this routine. It's the third time in as many years that Mark and I have been through this drill. Parent ill, get plane tickets, arrange flat, pack bags, get on flight ... then fall apart. Last year, when my mother made a similar phone call, people were literally walking in our door for Mark's birthday party. I broke down, then pulled myself together and held the (small) party. In a way, it helped me put the emotions on pause. This time though, I have some of my own health concerns to deal with first before I can fly. I really, really don't want to have to use one of those vomit bags during take-off, for instance. Unfortunately, this means I may have a whole month of "emotions on pause" before I can leave. And the cracks are already beginning to show. How do I let myself feel - without falling apart? I have to get our flat ready in a "I'm never coming back" way, same with my job. Maman, I am glad you told me in my 13th week and not my 6th. Even if I hadn't lost the baby, those weeks of severe nausea and vomitting would have been unimaginably more hellish. As I mentioned, I haven't had hot tea for a while. Mark made some cinnamon buns this morning, and so I made some tea to go along with it. And then I looked down at my mug and thought, "why is this tea black?!" Back in Scotland, Nathan had a big box of Clipper brand tea. It made these lovely golden brown cups of tea with no trace of bitterness after 5 whole seconds of exposure to water. Sigh. I miss Clipper. Thought it only fair to let you all know I am beginning to turn a corner and feel a bit better. I ate potato latkes last night (and oh my goodness I could eat them all day again today, they were so good!!). Okay, they weren't quite potato latkes - they were a Kazakh variety, but still. And today I ate cinnamon rolls and had my first cup of tea in 7 weeks!! I know this seems trivial, but it's pretty big to me, seeing as how I unwittingly lost 10 pounds in those same 7 weeks. Now I patiently (ha!) 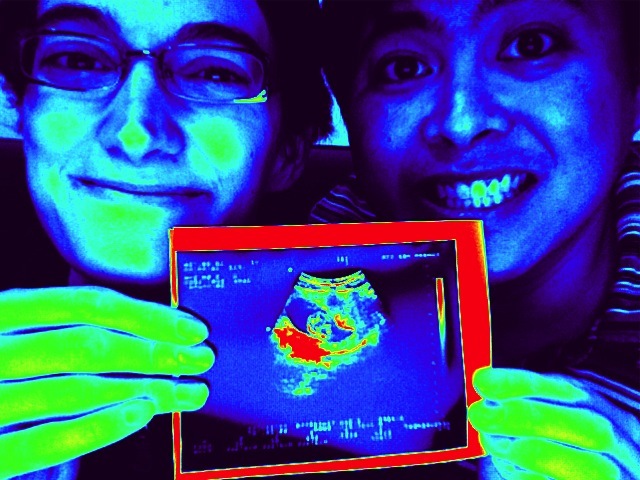 wait for an ultrasound on my pancreas. Know what? I hate prancrea-i. HATE THEM. Do you hear me?!?! Oops. I guess I'm slipping into my emotional feelings. Didn't mean to do that. ARRRRRRRRRRRRRRRRRRRRRRRRRRRRRR! Nash! Nash! Stomp around the room tearing things to pieces! "Your head could fall off and they'd say 'that happens sometimes during pregnancy'." It's the little things that get me through the day! No, it's not - I want the collection of short stories it's based on, too: A Gravestone Made of Wheat by Will Weaver.